The 16/17 Upper Deck Game Used product has come out, and like last year, it has come in a smaller package than in years prior. Upper Deck has gone with the one-pack approach here and price point that is well under the century mark. I like the direction this product is going, and I hope Upper Deck continues to refine it to be the best that it can be. The base cards in SP Game-Used are interesting... very interesting (as they were last year). Upper Deck has gone with the 'hard-to-get' base card concept. The actual base card of the player is numbered to their jersey number, and not every pack/box will have one. It's actually much easier to get a parallel version of the base card rather than the base card itself. 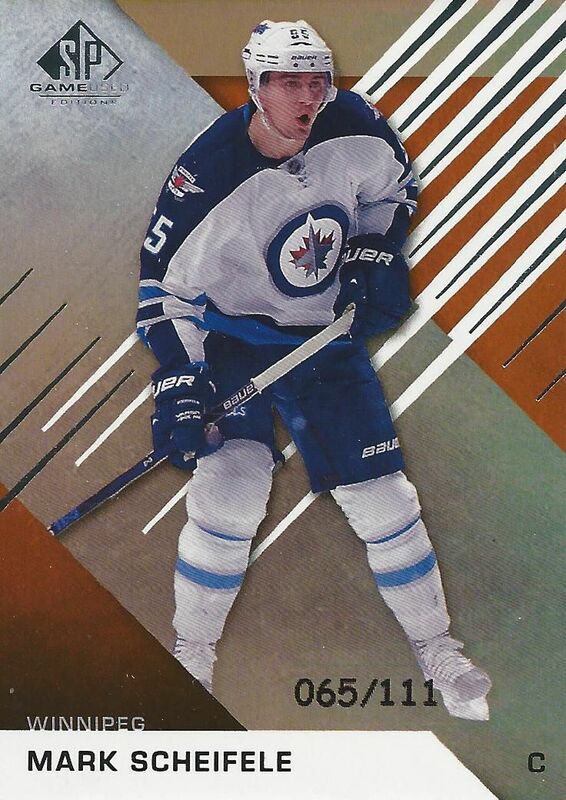 In my box, I pulled a Mark Scheifele orange parallel numbered to 111. Had it been his standard base, it would have been numbered to 55. In terms of design, the cards are on a nice, thick cardstock with a foil surface. The serial numbering has a 'retro-ness' to it that I think looks 'ok', but others may not like it. Overall the look of the card is good for a premium product like SP Game-Used. The back of the base cards are glossy and colorful. The design of the back has similar elements to that of the front, but without the foil. Content-wise, the backs only have stats - unfortunately there isn't a paragraph of information to read and enjoy. The rookies have the same serial numbering treatment as the veterans. Like the base cards, the rookies have their cards numbered to their jersey. The Blake Speers card I got was a rainbow parallel numbered to 219. The rookie cards have a different design than the regular base cards, but the look and feel match up well and are cohesive. Every tiny box of SP Game Used will pack in 4 hits. The other two cards will be serial numbered base cards. SP Game Used has an abundance of memorabilia cards to find - from jerseys, to patches, and more. With a name like Game Used, you'd think everything in it would be from a game. I wish that was the case! Like with pretty much all modern sets nowadays, collectors will find a wide variety of parallel cards. These parallel cards often become rarer as they get better memorabilia on the card. 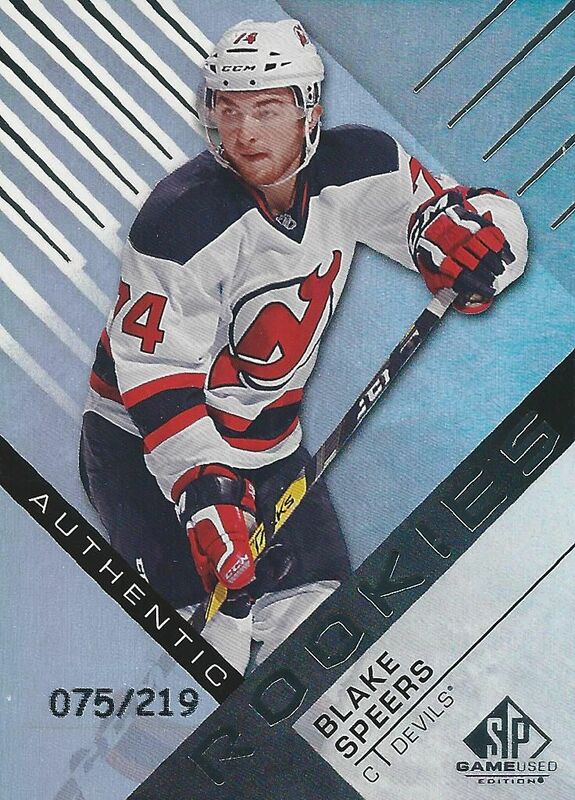 This Authentic Rookies jersey card is probably the lowest tier you'll probably find in the set. It is the standard rookie card design with a different color foil and a small jersey patch embedded. It's not a very exciting card, but a piece of the rainbow for collectors going for it. Interestingly, Upper Deck stamped these cards with the modern looking serial numbering rather than the older looking one on the base and regular parallel cards. Sadly, the jersey piece doesn't come from a game... it's from the rookie photo shoot. 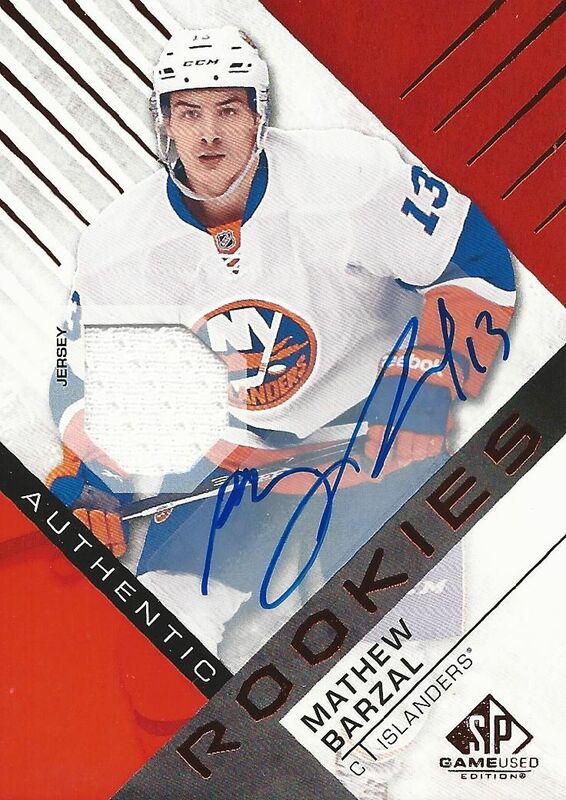 This card of Mathew Barzal is a step up from the Anthony DeAngelo I pulled. This card gets the red foil treatment along with a sticker auto. Strangely, there is no serial numbering on these cards. Higher tiered versions do have a low serial number, however. This is a nice card for a Capitals fan. It features three swatches of jersey used in the All-Star game from Nicklas Backstrom, Evgeny Kuznetsov, and Braden Holtby. This card is better than the previous two cards in that the swatches on it have some historical significance. That being said, it's still just jerseys (and they're all white). A patch version of this card would be pretty sweet though. 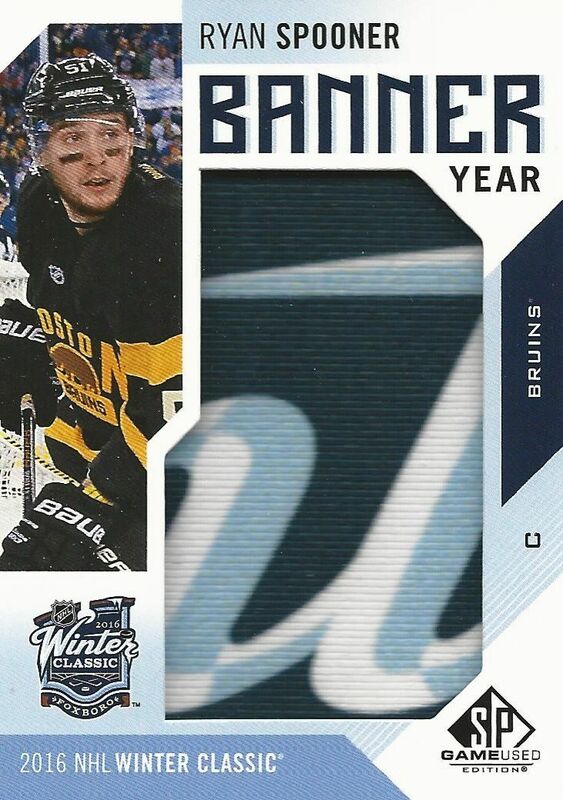 Banner Year cards have a cool look to them as they are very thick and feature a cut of a banner used at an NHL event. This particular one was from the 2016 Winter Classic. This type of card reminds me of some old stadium relic cards like seat cards or part of a base or something like that. The player probably didn't interact with this piece of cloth, but because it was at the game, the memorabilia piece does have some historical context to it. It's an interesting idea for a card... I'm not sure how invested in it I am though. My box of SP Game Used didn't really show what SP Game Used can put out for collectors. There are some great patch cards as well as other memorabilia that can be found. There are definitely things I like about SP Game Used and things I don't, but I'll start with the positive. I'm glad Upper Deck has SPGU at a better price point. A few years ago, people were buying boxes for around $200 and getting 4 or 5 jersey cards. That was absolutely atrocious! This little pack gives out better content than those older versions of the product. 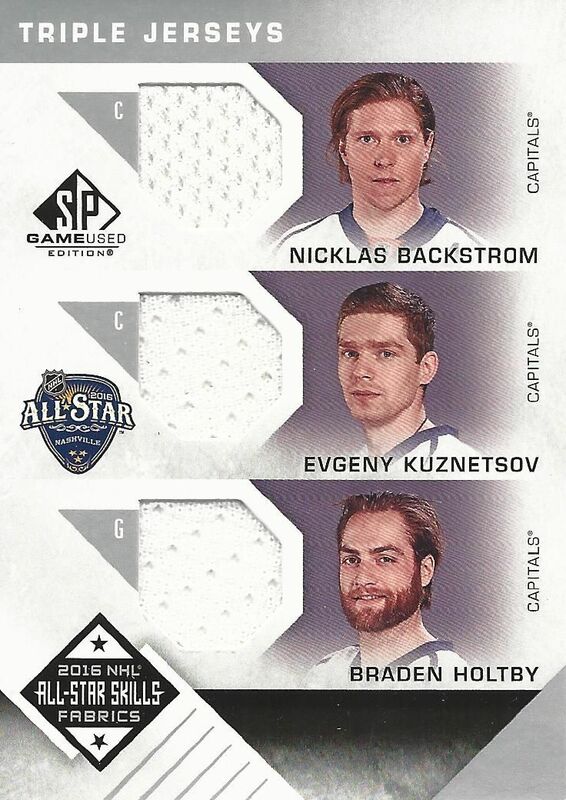 I also like that Upper Deck is putting in some unique items that you can get from the All-Star game here. It's sort of a niche thing to collect, but some of the memorabilia can be fun and enjoyable. On the downside, getting a box like I got can be pretty disappointing. Most of what I got were jersey cards and then the banner card. Perhaps it was just bad luck, but I would have really liked to get a patch card out of the box. The value here in my particular box was pretty low. All-in-all, I think Upper Deck needs to continue to work on SP Game Used. I'd be pretty happy if the whole product could live up to its name. The take on the All-Star game can be a good one. It's a very special part of the NHL season, so having SPGU be the brand that highlights it could be a great idea. In terms of value, I didn't get much, but finding 4 hits and 2 serial numbered cards for under a hundred dollars isn't too bad in today's climate of collecting. It's just up to you if you think the price is worth it. Great video and review. Ive always liked Sp game used. But in Canada, it can be a gample cause its so expensive. Overall great product. Started to pick up on sp game used back in 2014, love the product but a little pricey here in Canada. Your reviews are great as always! Nice I like the designs of the rookies. Tiny box. Hey blacksheep, very great vid as always. Pretty good hits as well. Not really a fan of this product as in Canada it costs a fair amount and you mainly get jersey cards. However the designs are nice. Great review! Great video as always like the product and your banner card had a nice peace in it. Hey awesome reviews,I started watching about 2 months ago and always looking forward to your next review, keep up the great videos! Great review like always, nice Barzal! I honestly hate the product but the banner cards are sweet and they have another card i forget what it is called but its basically like a framed jersey! + I usually don't like when products goes from having several packs to just one. But in this case, the new configuration is better. + Interesting concept with the base cards, even though I don't really understand the weird numbering of the parallells yet. - The lack of game-used memorabilia. - Where dis they find that banner? A bit of history behind it and I maybe would've liked these cards a bit more. As of now, they're just like manufactured patches in my eyes. A nice looking product but too many jerseys in my opinion. That box was a total bust imo. I have seen some good stuff come out of this product though! I enjoyed reading your review, I find this product to be totally pathetic. First of all the base design is kinda messy I don't like the crooked design. Second, half the memrobilia you pulled in SP "Game Used" were not even game used... of all the products UD has released this is easily one of the worst. Seens a bit pricey for the limited # of cards you get. Nice review, definitely not something I'd pick up. Nice review not sure if I will buy it. Good review as always, Luke. Some decent hits in your break but a tad underwhelming for the price. Glad you got a jersey-auto in your box but like you, I am on the fence about the banner cards being considered "hits". Ahoy, thanks for another great review. After seeing your break I won't get SP Used this year. I guess tos must be the lowest end of the one pack boxes. Couldve benn better for its 80 dollar price tag. I really like this years sp game used! I think the banner cards are pretty sweet, rough box though :/ little pricier product here in Canada though. Great Review as always Luke! I personally prefer how UD did Game Used this year and last year compared to before. Before the product was no where near the price. That's a really nice box, but for the price and the number ofcards on it, I don't think I'll buy this type of box. Whatever it's a really good review. Love the design of them this year.. I feel as it is a bit pricier product the should at least remove the single color jerseys as well as the stickers for the autos. Anyways good hits though.. I've always been a fan of game used! A solid enough product, but slightly lacks in areas. Watched a fair number of box breaks of this years product the last week, lots of boxes seem a little weak sadly. The sticker serial numbers take away from this higher dollar product a bit IMO. Overall, nice product but I might just buy singles of cards I want from it online compared to buying myself a box. Looks okay but i still think this years black diamond cards look way better. 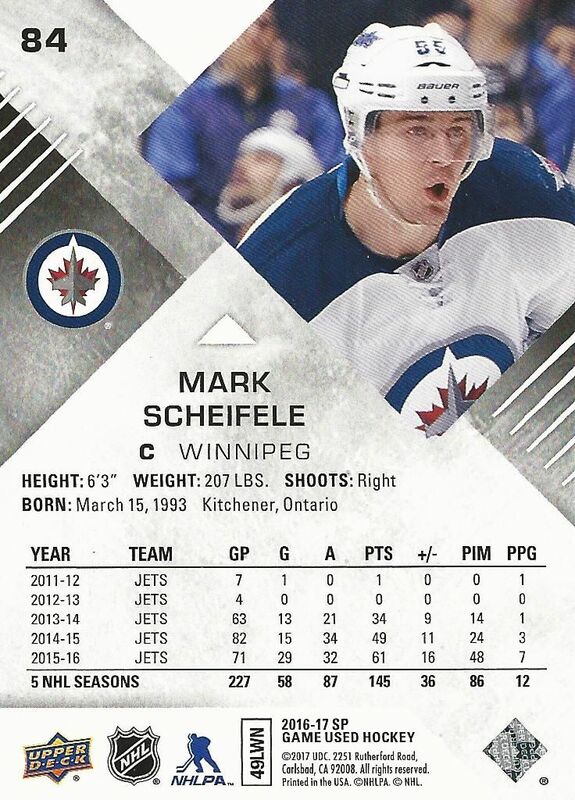 beauty scheifele! Great fair review as always. Nice Jersey card of the capitals! It's incredible how tiny the box is! Nice break! I'm interested in where the banner cards are going too, seems like it is at the very least a good idea to explore. Nice barzal, and sick break as always! Nice clean, cut designed cards! Nice break! I love the bruins banner card!!! really neat!!! Nice Post . . . .